Joseph Mallozzi's Weblog: January 14, 2010: Jason Momoa the new Conan? He should be! January 14, 2010: Jason Momoa the new Conan? He should be! Well now, this is interesting. Rumors have the producers of the new Conan movie close to casting their lead (http://www.joblo.com/index.php?id=30407). 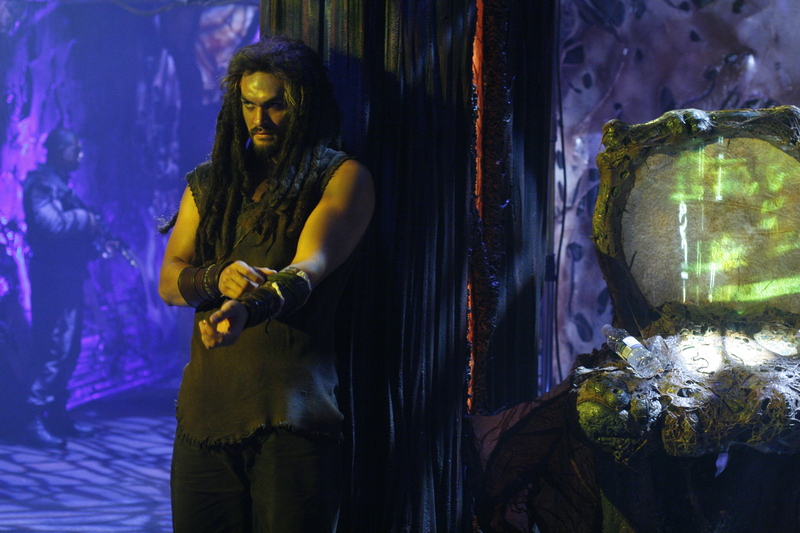 And they’ve apparently narrowed their choices down to two or three possible candidates, one of them none other than our very own Jason Momoa, Stargate: Atlantis’s Ronon Dex. My take? Hell, yeah! I think Jason would be perfect. He possesses not only the requisite physical stature and bearing, but a genuine warrior’s spirit that would imbue the role with a depth and complexity others would be hard-pressed to match. He’s also dedicated many years to honing his battle skills in both sword and hand to hand combat. And, speaking from personal experience, I guarantee that Jason will go to unbelievable ends to research and prepare for the part, focusing his entirety on delivering what would no doubt be a big league performance. Finally, if you’re looking to draw a female audience in addition to those action-oriented males, then I’d say Jason’s good looks cement him as the ideal candidate to play Conan. So, there’s my vote. Your thoughts? Feeling a little under the weather – but I suppose that’s to be expected. I went out for vegetarian food tonight. A full report with all of the gory details (and equally gory pics) in tomorrow’s update. Thanks to everyone who posted well-wishes for mom. I’m sure she’ll be thrilled once sis directs her to the blog. Major D. Davis writes: “1. Is Andy mikita directing the season 2 premier? Answer: The budget is set before prep for the season even begins. That amount is divided up between the 20 episodes, thus establishing our pattern episodic budget. Some episodes will prove more costly and that’s alright – so long as we make up the difference by producing less expensive episodes. This way we ensure that, by season’s end, we don’t come in over budget. Answer: Yep, the coast is clear. Welcome back, Sheryl. Answer: If you’re looking for answers, you’re best bet would be to ask the question here. 1. Will future SGU episodes include any increase in the amount of Stargate humor than what we saw in the first half of season 1? Answers: 1. The tone of the second half of the season will be consistent with the first. No Family Ties or Harmony-type episodes. Answer: The same one I took the last time I went – John Varvatos, Vintage. Previous Article January 13, 2010: Reclusive Raccoon Wins Powerball Lottery! I love SGU but it really could use some additional humor it gets a bit tedious at times. Don’t get me wrong I like the more serious tone but lighten it up just a bit please! Keep up the great work I can’t live in a world without Stargate! They’re making a movie about Conan O’Brien? I’d heard this stuff with Jay Leno was getting nasty, but I didn’t realise there had been sword fighting and battles. Not sure if this was a promotion or not, but congrats on the Executive producer promotion for SGU next season. You and Paul did an amazing job with SGA, and although I felt SGA needed one more season to finish and could of based on it’s performance, I still am enjoying SGU. I look forward to the eps you guys wrote in the 2nd half of Season 1, and it looks like it is half of them, so all good things. I have to say, that I think “The Last Man” and “Remnants” were some of you and Paul’s best work. Keep it up, I am truly looking forward to your eps to come for SGU. If Jason gets the part, I’ll go see the movie. Otherwise, Conan’s not my thing. Now if you could avoid any Quarantine or *spits* Space Race *spits* style episodes as well, that’d be great. Hell, yeah too!! Drop dead gorgeous! I’ll watch anything Jason does. Thank you for the beautiful pictures. Yes…..Jason would make a great Conan the Barbarian! Some other day, some other time, it may have been me you smoked. Goo’night to y’all. I must mosey. There’s a sunset to be ridden off into. RE: Jason the Barbarian – Oh, yeah! That would be excellent! And though Elric, his antithesis, is more my style, Mr. Das LOVES Conan! He’d be thrilled if Jason got the role! Not holding my breath, however…Hollywood’s disappointed me far too often. Feel better, Joey! Hugs to sis and mom! Go Jason! Go Jason! Go Jason! It is just me, or does anyone else think that our *Guy* is being typecasted…? — He just finished shooting his Khal Drogo role for GAME OF THRONES a couple of months ago. *NOT* that I’m complaining any!! [BTW, watch your step! Be careful of the old-enough-to-be-his-mother puddle of drool over there…] Met the *very* rather strapping young lad at a con a few months back… If he gets the role, for *SURE* I’ll be camping out in a theatre line, just waiting to drip my hand into a bucket of hot-buttered… [*cough*!] … ah, yeah, right… “popcorn”….! 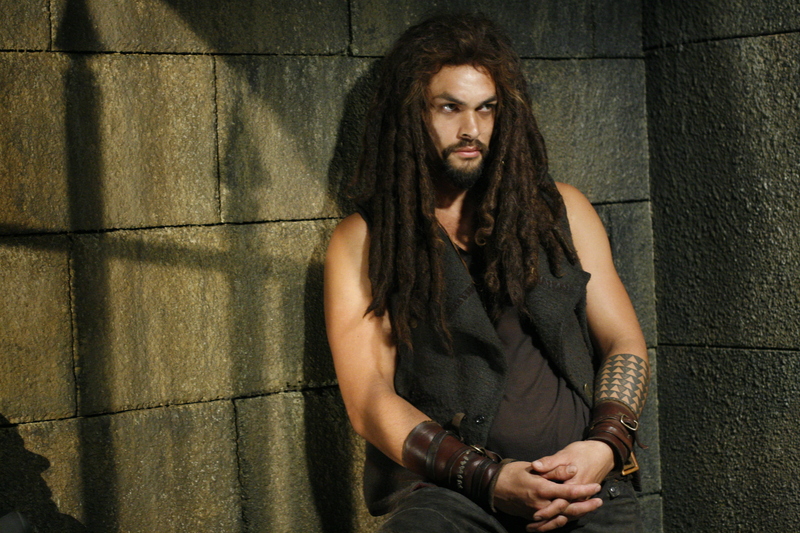 Oh, they should totally cast Jason Momoa! He’s not exactly the type I’d get all drooly over (reminds me a bit too much of my brother for that), but I think he’s awesome. I’d definitely see it if they cast him. Are you saying you were feeling under the weather, so you went out for vegetarian food, or that you are under the weather because you went out for vegetarian food? And I loved “Harmony” too! The humor is great, that kid is a riot, and Rodney is exceptionally himself in that one. LOVE the portrait at the end, whoever thought that up gets a gold star! @Narelle – rimshot! Good one! @Sis – Does Mom Mallozzi have any games on her cell phone? Can you load any, like card games etc? My mom carries hers now, keeping it off unless she needs to make a call. Or play games, which she now does obsessively -at which time she will also deign to see if there are any messages. Still working on her and stepdad to carry said cellphone when walking their med-large dog in the woods alone. She can, however, use the laptop now!! That would be great casting … Jason M as Conan! I’d have to watch that. PS Hope you’re feeling better soon. I second that: Hell, yeah! Jason would be perfect. Besides, it’s been a long time since we saw most of the Stargate actors in TV shows/movies (new projects). Way too long. Conan with dreadlocks… Hmmm, why not? In any case I wish him good luck with getting the role. 1. I have been thinking, a lot of people must be wondering about how to write a script and how such a script would look like. Any chance you could put an old one here, or have a link to one? Maybe an old SG-1 or SGA script. Since they already aired, I guess there shouldn’t be a problem with that? I am mainly wondering because I can’t quite imagine how you write, so that everyone knows the required tone of a scene. I guess while you write the script, you also have a certain setting in mind (stage, props, special FX, sounds etc.). How do you make things fit toghether? 2. When you have songs in an episode like e.g. “Byond the night” in the SGA episode “Critical mass” do you write the songtext so it fits the scene, or does the songwriter take care of that? Or do you rather pick an existing song that fits and enhances the atmosphere regardless of its text? Syfy managed to air three episodes of SGA in three straight days in their afternoon slot, which shocked me. Even better, got to rewatch The Last Man. It’s impressive how much some of the scenes could impress me. Even some of the guys at work were caught up in it. I hope that someday I can become invested enough in the SGU characters to feel the same emotional impact. Jason is so totally great for the Conan role. I’ll be rooting for him to get the part. If he does, that will be one movie I go to the theater to see, and not wait for the dvd release. Sorry to hear you’re under the weather. Some bug seems to be going down locally, with a couple of coworkers already knocked out by it. But in you case is it a cause and effect from eating(with all due respect to Ashleigh) a yucky veggie meal? Perhaps you shouldn’t take any chances, and henceforth eschew such dietary choices? Hope you feel better soon, and thanks for the Mamoa news. First off: Sorry to hear about your Mom. I wish her a speedy recovery. She really is having a bad run of hospital related stays. Please convey our very best from Ireland to her. Second: Re: Jason for Conan….really great idea. Iconic role and I know that he will bring real worth to the table with that role. I wish him the best with that audition. Third: Has the SG Props ebay auction ended forever? Can you ask Lauren? Finally, safe travels home to Ivon Bartok who was in the Dominican Republic when the tragedy happened in Haiti. Thoughts and prayers to all those affected by the unimaginable devastation. Best to you and all at The Bridge from Ireland. Jason would make a great Conan – he certainly gets my vote! Agreed Jason would be cool as Conan!! Conan? 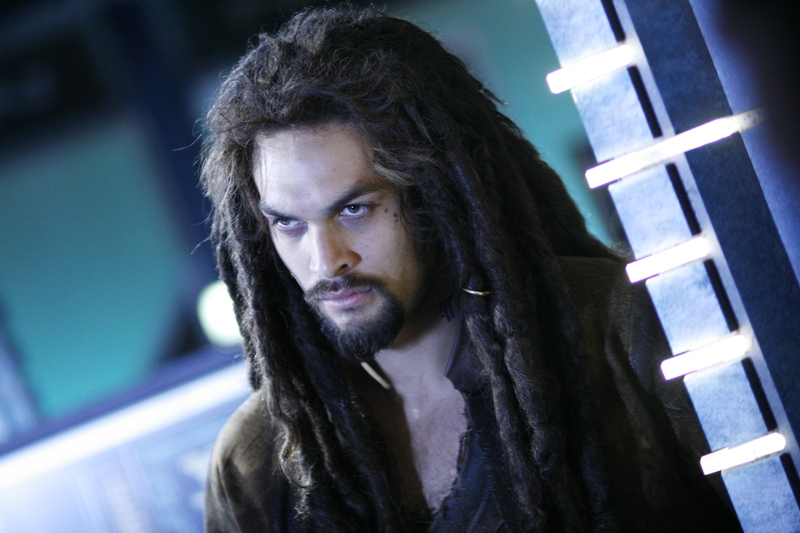 Ronon? He’ll get the role because they rhyme!!! He’s perfect for the role. Hope this Conan will smile though, because Jason has the most amazing smile. Try to have a good day at the office! I agree that Jason Momoa would be a great Conan. I know very little about Momoa personally (and obviously less than you), but from his portrayal of Ronan I always got the idea that he’s a gentle person in real life.